SMART, stands for Small to Medium Area Repair Techniques. 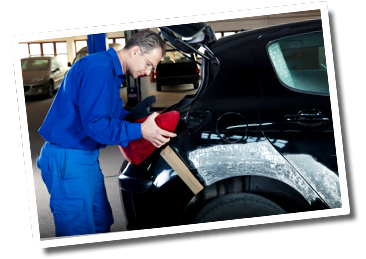 They are unique methods used to professionally repair minor damage to a vehicles' body work, without the inconvenience and expense involved with taking it to a body shop, using the same body shop quality paints and materials. This approach is also benefitting the environment due to the fact that the car's damaged parts are being repaired rather than being replaced. "Many thanks to John and the team [with the magic tools and know-how] for your prompt, polite and efficient service in repairing two dented panels and patching in some stone-chipping damage on the bonnet of my Audi A4 the finished result is superb; in fact, it looks like new." You can contact us via email by completing the form below. Remember to include your car make and details of the problem including any images you have taken. As part of our continuing adherence to standards and technical improvement we were approved in 2007 by the Vehicle Repairers and Builders Association (VRBA).